The last exams for this qualification will be in the November 2019 series. There will be no resit opportunity. The first exams for our new specification will be in the January 2020 series. This specification, Functional English Level 1 and Level 2 (4720, 4725), gives students practical skills for the modern world and helps them get the most from life, learning and work. Often a student's first accredited qualification in English, this course can be used in preparation for GCSE. It is suitable for a wide ability range and is used by many schools as a replacement for SATs. There are no prior learning requirements for this pass/fail qualification. Level 2 (specification code 4725). 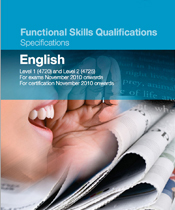 Entry Level Functional English is a different specification suitable for people working towards this qualification.